NORTH BAY, Ont. – The North Bay Battalion delivered a dramatic demonstration of its resilience Sunday, defeating the Barrie Colts 5-3 in an Ontario Hockey League game in which the score flattered the losers. The Battalion, without five regulars, rallied from a 2-0 deficit in front of 3,387 fans at Memorial Gardens to gain a split of a home-and-home series with its Central Division rivals less than 24 hours after being routed 12-2. Mathew Santos scored two goals, Kyle Wood had one goal and one assist and Aaron Dart and Cam Dineen also scored for the Battalion, which got two assists from each of Mike Amadio and Daniil Vertiy. Goaltender Jake Smith made 35 saves to extend his franchise record for career wins to 75. North Bay, which has beaten Barrie in three of four meetings, has a won-lost-extended record of 19-14-3 for 41 points, tied with the Niagara IceDogs for third place in the division. The Troops have won their last eight home games, the last loss at home a 4-3 setback Nov. 19 to the Kingston Frontenacs. The Battalion, which dressed 18, two below the limit, was without defenceman Riley Bruce and forwards Mike Baird, Zach Poirier and Brett Hargrave, all of whom are suspended, the last two for fights at Barrie. In addition, rearguard Zach Shankar sat out with an ankle injury suffered in that game. 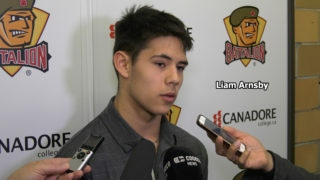 Justin Scott, Anthony Stefano and Kevin Labanc scored for Barrie, 22-13-1 for 45 points, first in the division. Starting goaltender David Ovsjannikov was pulled after allowing five goals on 25 shots, and Ruan Badenhorst made seven saves in relief. Scott opened the scoring at 12:55 of the first period, going to the net to knee his own rebound past Smith. After a lengthy video review, referee Andrew Thompson’s goal signal was allowed to stand. Stefano struck at 1:50 of the second period, moving around a fallen Smith to shovel home a backhander, but the Troops scored the next five goals. 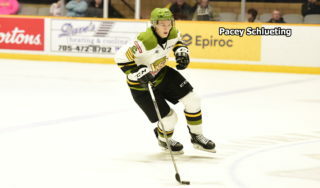 Dart, making his OHL debut after being called up from the Powassan Voodoos, sparked the Battalion comeback at 2:53, beating a screened Ovsjannikov low to the glove side off a rush. Brett McKenzie and Jacob Ball earned assists. 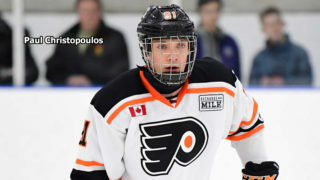 Wood tied it on the power play at 6:29, hammering an Amadio feed past Ovsjannikov from the top of the left-wing circle. The goal was defenceman Woods’s fifth of the season. The Troops struck again on the power play at 15:40 when Santos drove to the net and ripped home a backhanded feed from Vertiy. Amadio earned the second assist. Blueliner Dineen scored what proved to be the winner 39 seconds into the third period when his shot from the top of the left circle glanced off defender Michael Webster. Steve Harland collected the lone assist on rookie Dineen’s sixth goal. Santos sent Ovsjannikov to the bench with a man-advantage goal at 2:27, redirecting Woods’s left-point drive between the goaltender’s legs. Vertiy also assisted on Santos’s 12th goal. The Colts, who stormed Smith’s crease in the fifth minute, scored shorthanded at 7:23. Andrew Mangiapane rushed down the right wing and fired a shot that Smith stopped, but Labanc converted the rebound on a backhander. Barrie enjoyed two power plays over the rest of the game, including after a spurious tripping call against Amadio, but couldn’t generate a scoring chance. The Battalion, which wore its dark, namely green, uniforms at home, as is OHL practice in the New Year, hosts the Erie Otters at 7 p.m. Thursday. BATTALION BULLETS: Amadio has 116 career assists, one more than Luke Lynes and fourth in franchise history. Amadio has 49 power-play assists, seventh all-time and again one more than Lynes … North Bay went 3-for-5 on the power play. 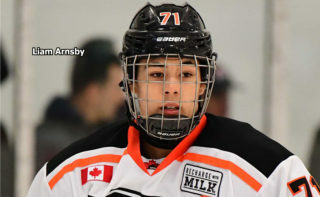 Barrie was 0-for-5 … Opening lines featured Amadio centring left winger Vertiy and right winger Santos, McKenzie centring left winger Max Kislinger and right winger Harland and Kyle Potts pivoting left winger David Sherman and right winger Justin Brazeau. 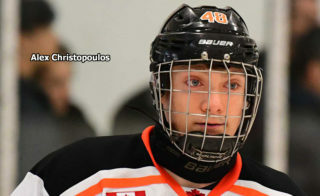 Left winger Ball and right winger Dart had various linemates … Dart, 19, is a North Bay native with five goals and five assists for 10 points in 27 games in his second Northern Ontario Junior Hockey League season … Baird speared Rasmus Andersson at Barrie and is suspended for at least three games. Poirier and Hargrave each got two games … Bruce is suspended indefinitely after what was deemed a head check on Owen Tippett of the Mississauga Steelheads in a 6-3 home-ice win Thursday … Colts blueliners Rocky Kaura and Josh Carrick were suspended for two games apiece for fights at Barrie … Barrie again was missing centre Julius Nattinen, with Finland at the World Junior Championship. 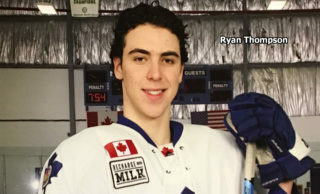 Goaltender MacKenzie Blackwood has yet to rejoin the Colts after Canada was bounced from the tournament in a quarterfinal Saturday.